This image was captured during one of the most memorable weddings I’ve ever had the privilege of photographing during my 30 plus year tenure as a wedding photographer. This was a destination wedding held at the incredible Majestic Colonial Resort and Hotel in Punta Cana on the Caribbean island of the Dominican Republic. What an extraordinary experience! Day one we flew in and spent the entire afternoon scouting out extraordinary locations on the resort’s sprawling property. On day two we hooked up with the bride and groom and did a pre-wedding couture photography session where we took casual, candid pictures of the bride and groom under the palm tree lined walkways, on the beach, in various stunning architectural elements of the resort and even at one of the swim up bars in the 1/4 mile long lagoon swimming pool which runs the entire length of the resort. We ended this session with a "trash-the-dress" style shoot with the bride and groom diving into the blue green tropical ocean waters in their clothes. Day three was the actual wedding, an intimate gathering of about 50 close friends and family members that turned this wedding event into an awesome vacation as well as a celebration of the couple’s love. We started with traditional preparations shot of the bride and her Maid of Honor preparing for the big day. Then came the reveal in the magnificent architecture of the resort’s open air lobby where the groom saw his bride in her gown for the first time as she descended the mahogany railed marble steps of this luxurious resort. Formal photographs of the couple and their friends and family followed and finally, with the backdrop of a breathtaking Caribbean sunset came the wedding ceremony on the beach. After the ceremony the guests were ushered to their own private section of beach where elegant tables were meticulously set for a candlelight, beachfront wedding reception. My assistant and I spent the next three days unwinding and doing a little vacationing of our own, thanks to the generosity and hospitality of our clients. If you are planning a destination wedding be sure to retain the services of a photographer who has experience with these events. To some new, inexperienced photographers these events look very glamourous. But they come with their own set of challenges that can turn into a nightmare if your destination wedding photographer is not experienced. For starters, it can be a logistical nightmare. All of the expensive camera, lighting and support equipment you are leaving the country with must be registered with US Customs before you leave the United States. There is a well-established "Gray Market" for photographic equipment in The Caribbean so you had better be prepared to show US Customs, upon your return to the US, that all of the appropriate duties had been paid on your gear before you left. Of even greater concern is having the necessary work permits to perform professional services abroad. Some locations, such as the Cayman Islands, require you to get a simple work permit for a modest fee. 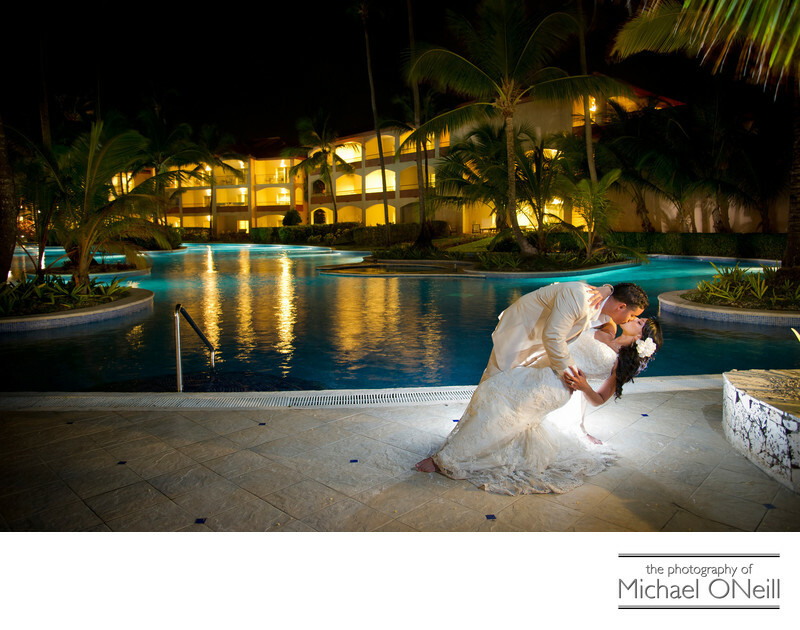 Locations like the Dominican Republic, a very popular destination wedding spot, are much more demanding. Without the proper work permits your photographer’s equipment can be confiscated and they can actually face arrest for attempting to earn money on their island. Be sure to question any photographer, in depth, about their experience in photographing destination weddings in foreign countries. In addition to the weddings I have photographed in the Caribbean, I am also available to travel about the United States for wedding assignments. I have done weddings outside of my normal Greater New York area in Virginia, Maryland and Florida. If you are planning a destination wedding you owe it to yourself to call me and take advantage of my expertise. I would love to work with you, your friends and family on your dream event in Paradise!